The 20-acre Lake is the largest of Central Park's naturalistic water bodies. Park designers Frederick Law Olmsted and Calvert Vaux created the Lake from a former swamp, for boating in the summer and ice skating in the winter. 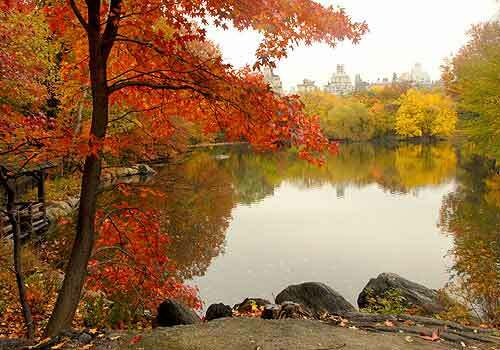 In 2012 the Central Park Conservancy completed the comprehensive restoration of the Lake and its surrounding landscapes. With the water's edge having slowly crumbled and eroded through the years, the Conservancy set out in 2006 to stabilize its shoreline. The team excavated and removed excess sediments, then reconstructed the shoreline with rustic boulders on a stabilized gravel base. Using coir logs, created from the binding of coconut fibers with biodegradable netting, the Conservancy reconstructed the vast shoreline Staked at the base of the slope where the normal water level meets the shoreline, the logs serve to protect the Lake's edge from erosion until plants can become established. The coir logs are a sustainable solution to the Lake's restoration, and one that's helping preserve the beauty of its lush landscapes and the health of its wildlife habitat.